Summer is really over and the water temperatures are down from around 17°C to 13°C. We have not made it to any of the wrecks or rocks off The Lizard and the last set of dives was just of the good old Silver Steps in Falmouth. We had set ourselves some goals though: Chris needed Snakelocks anemones for his student projects and I wanted to catch myself some Leopard-spotted gobies for the aquarium. The Snakelocks were collected quite easily as they are so abundant. For the fish, I had bought a cheap foldable trap. The idea was to set it up in a little overhang housing the gobies, weighing it down with some rocks and come back the next day to take it back out. For bait, I had brought a chickenbone leftover from someones lunch at work. 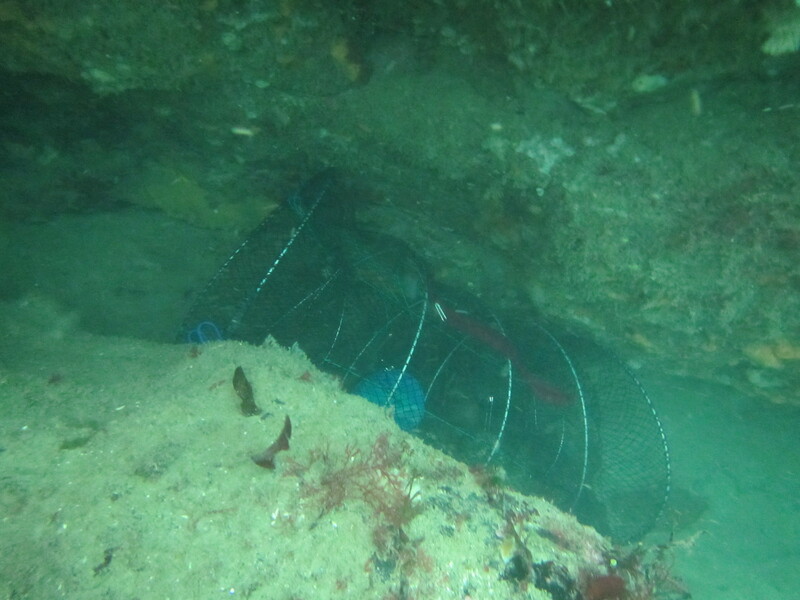 Below, a crappy pick of the trap wedged between rocks and below that a snap of some of the catch the next day (I had a two-piece websuit and in combination with an almost empty tank I was getting too buoyant to take decent photos): Three nosy Tompot blennies and also a small Conger eel; no Leopard-spotted gobies. 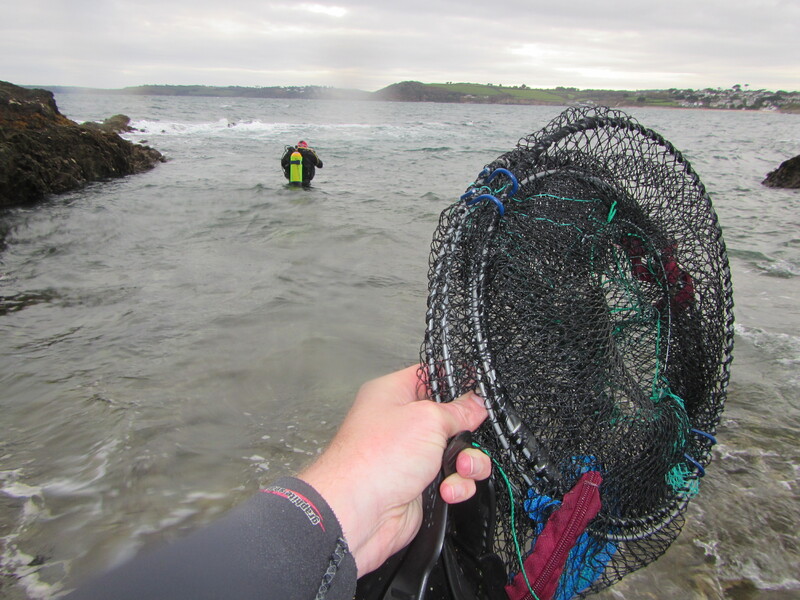 So at least I know that in principle next year I can try trapping fish, but it might be hard for the gobies as they are very reclusive and do not barge into nets as Tompots do. 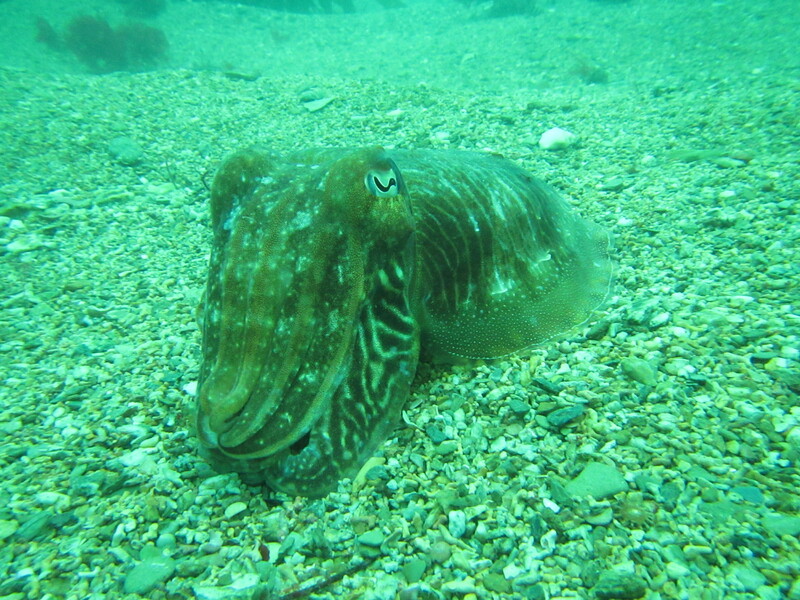 The first dive, the visibility was OK(ish) and we saw a Cuttlefish Sepia officinalis. Although I have seen them before, you never get tired of them! No other special finds. The place was absolutely swarming with Spiny starfish and most Snakelocks seemed to have multiple Leach’s spider crabs underneath them. I saw another Blackfaced blenny. Next year it is high time to dive further and deeper and also to finally get some gobies into the aquarium! 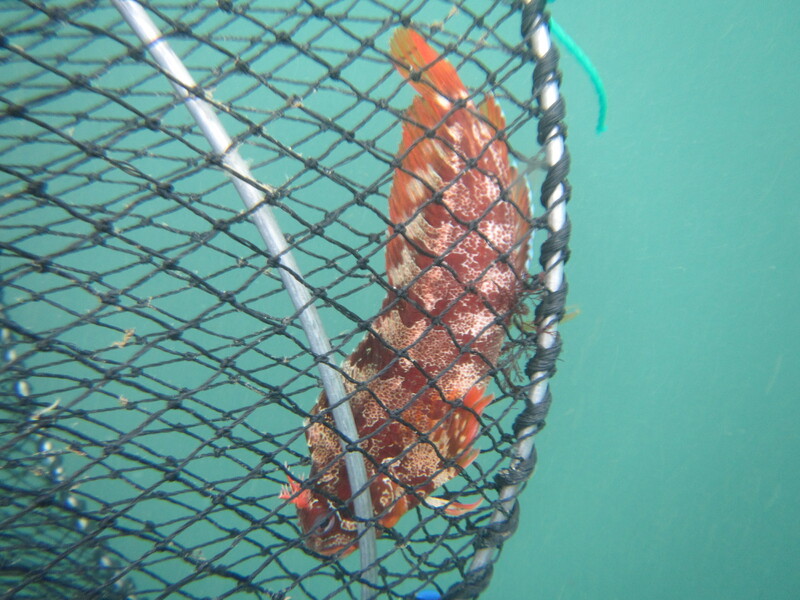 This entry was tagged Conger eel, Cuttlefish, Falmouth, Leopard-spotted goby, Sepia officinalis, Silver Steps, Tompot blenny. Bookmark the permalink. No, never tired of eating them. Cool movie! Super. Fantastic cuttlefish, I find them fascinating to watch too. And what a pretty blenny. Looks like the vis was decent – much better than Hong Kong in November – we’ve got just a couple of metres, it’s like soup at the moment. Your posts really make me want to come and dive in the UK. 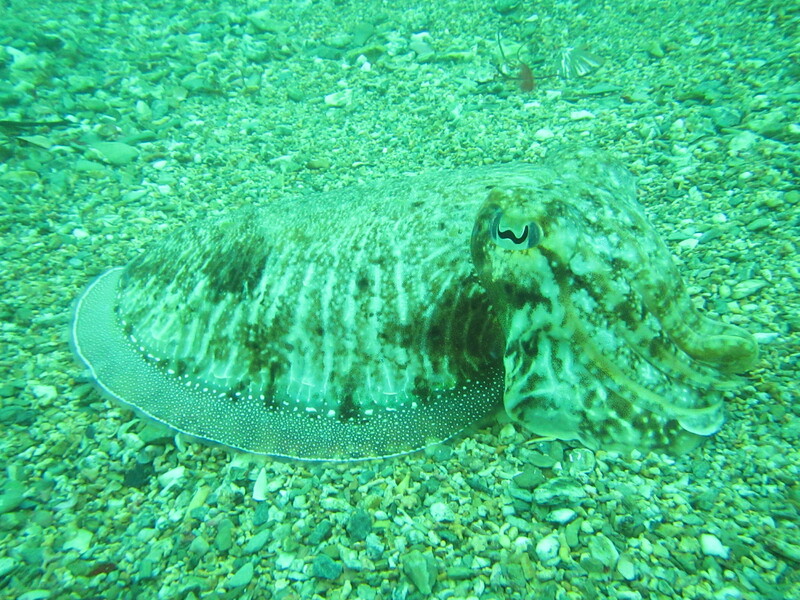 If you got a little strobe for your camera you could fix that green tinge and get more colour on the cuttlefish. the viz was quite bad one day and a bit better the other (also not more than a couple of meters). 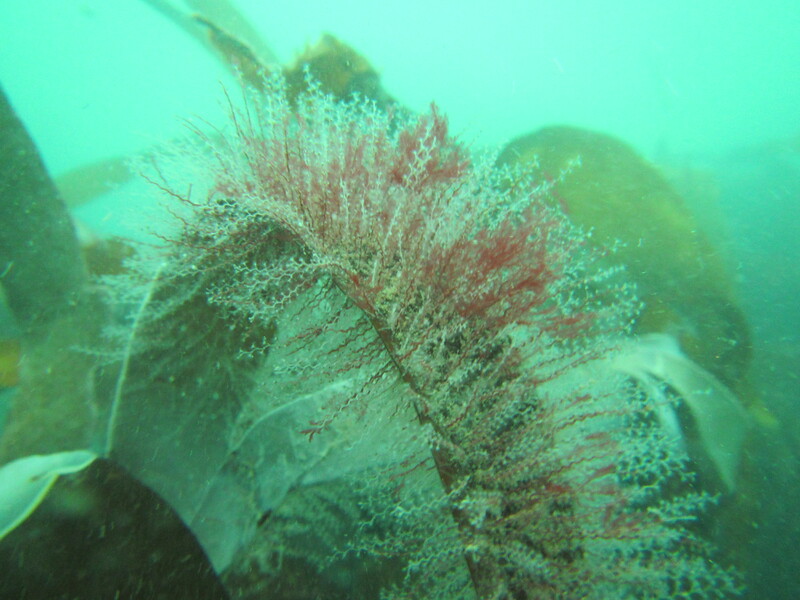 I really like diving here but the biodiversity in Hong Kong is much higher so it is me who is the more envious I think! I have recently started a small aquarium with soft corals to be able to still enjoy these; I will put up some pictures here soon. The Tompot blennies are beautiful; I have some pictures of one I had in my aquarium on the blog too. The cuttlefish are one of the most interesting animals around here. There are octopus too but they live deeper generally and are much more rare. A strobe for the camera would be a good idea but I am not sure whether these are available for a small point-and-shoot thing like I have (Canon Powershot). With the bad viz probably mainly good for macro (which this camera is not great for), otherwise it might just light up the ‘marine snow’.